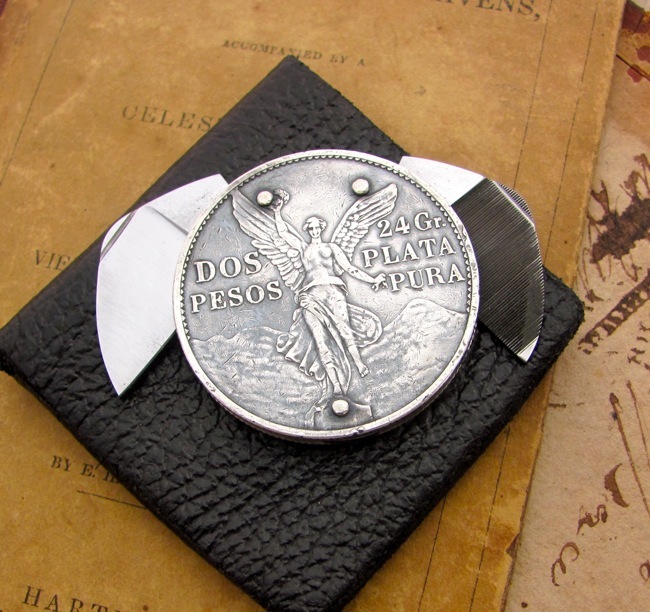 Coin Knives are handmade from real antique and vintage Mexican silver coins. 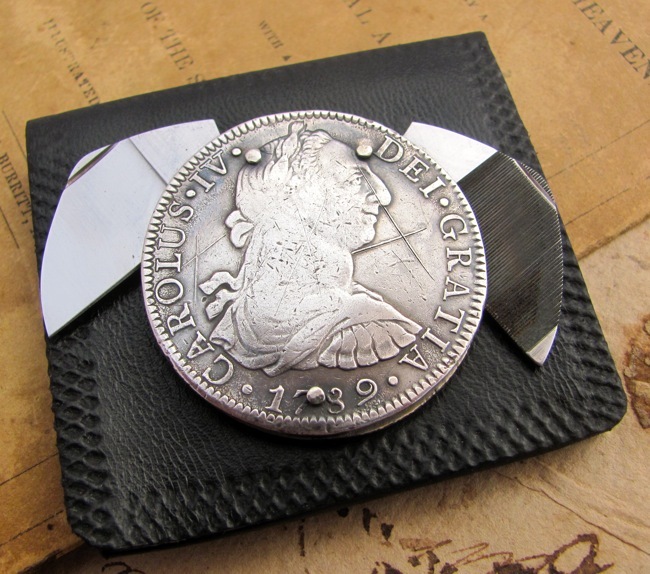 High grade, solid silver coins are precisely split in two, then re-assembled with a miniature spring and two folding blades inside - a sharp cutting blade and a nail file blade. 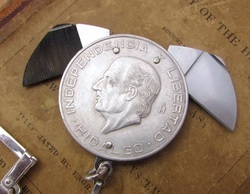 Three small nickel-silver rivets hold the coin knife together. Each comes in a hand stitched leather pouch. They are approximately 39mm to 40mm (1.5 to 1.6 inches) in diameter. Prices vary according to the rarity and condition of the silver coins. In France they are known as "couteaux monnaie" or "couteaux onglier" Please check the Available Knives page to see what's on hand. The oldest coins I use are the 8 Reales milled bust coins. 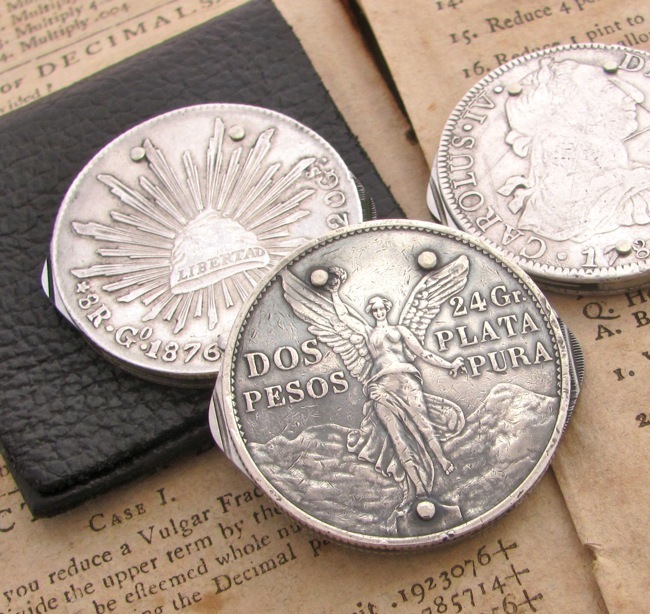 They were minted by the Spanish at the Mexico City mint from 1772 until Mexico's independence in 1821. These "pieces of Eight" were the world money standard until the 1850's. Described below are some of the various Mexican coins I use to make the Coin Knives. 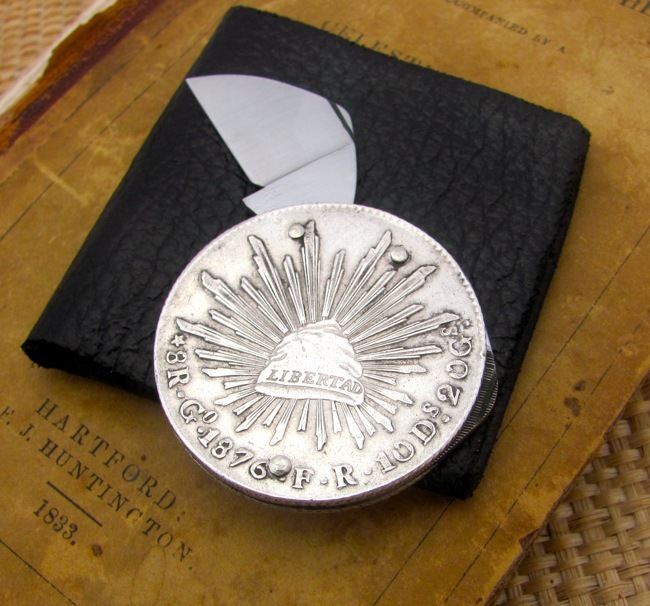 Between 1821 and 1823, silver 8 reales were issued by the government of Agustín de Iturbide. The reverse carried a portrait of the Emperor with the legend "August(inus) Dei Prov(identia)" and the date, or "Augustinus Dei Providentia" and the date. The obverse had several different versions of the Mexican Golden eagle. The eagle was a traditional symbol of the Aztecs, but it's design was changed according to European heraldic traditions The legends read "Mex I Imperator Constiiut" together with the denomination and assayer's initials. With the adoption of the 1824 republican constitution, the United Mexican States began issuing new silver 8 reales. On the republic's coins, the Mexican eagle moved to the obverse, with the legend "República Mexicana". The reverse featured a liberty cap with rays behind. The legend on the reverse reads "-denomination- -mintmark- -date- -assayer's initials- 10 Ds. 20 Gs." Mexico used the medieval system of dineros and granos to measure the fineness of their coins, twelve dineros designating pure silver with each dinero divided into 24 granos. A coin of 10 Ds. 20 Gs equated to .902777 fine. 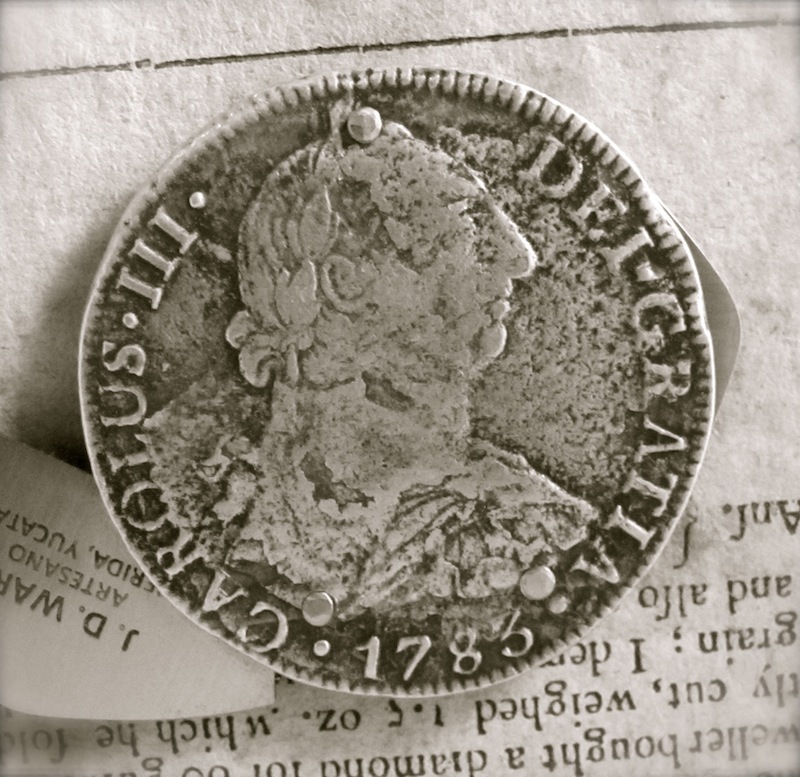 At the end of the 19th century, the 8 reales coin became Un Peso. 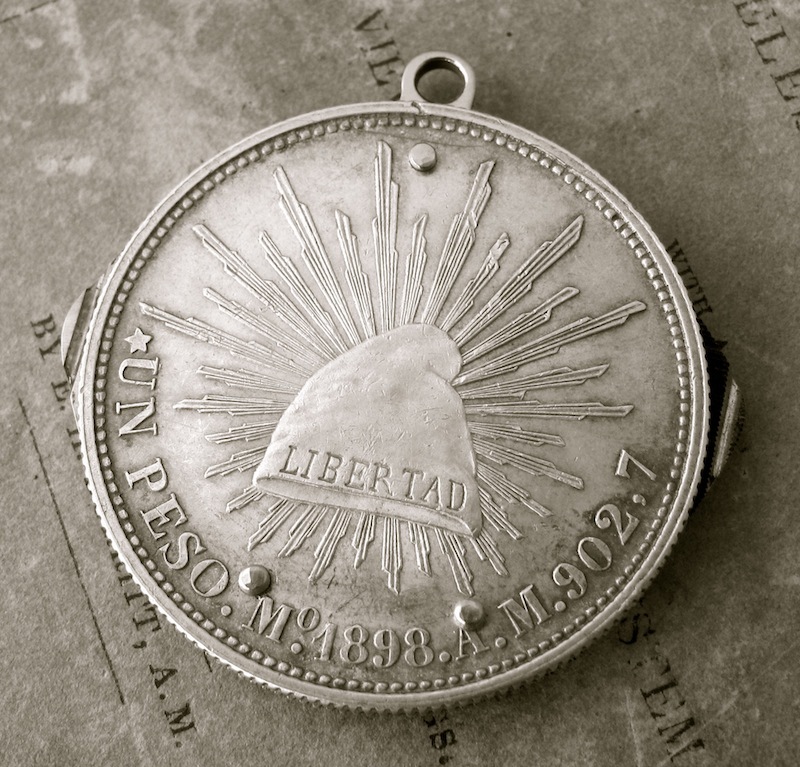 For one year only, 1921, Mexico minted a silver Dos-Pesos coin to commemorate 100 years of independence. The reverse features the Angel of Independence before the twin volcanoes, Popocatépetl and Ixtaccíhuatl. The obverse the Mexican Eagle on a cactus, and Roman numeral commemorative dates. The coins are 39mm in diameter and .900 silver. Shortly after the Mexican Revolution, the newly formed Mexican Government issued their first Peso coin referred to as the “Caballito Peso” or as translated to English Pony or Small Horse Peso. The Cabillito Peso was a crown size coin struck in 90.3% silver to celebrate the War of Independence and was issued from 1910 to 1914. Today, it is a highly collected coin and is regarded as one of the most beautiful crown sized designs throughout North America. The obverse features the Mexican coat of arms, an eagle clutching a snake while it perches on a prickly pear cactus and the denomination “UN PESO”. On the outer periphery is the phrase “ESTADOS UNIDOS MEXICANOS” or as translated to English “United Mexican States”. The reverse design features a woman riding a horse holding a torch high above her head and in her other hand holding a laurel branch. In the background is the sun with rays. The coin edge is lettered with the phrase “INDEPENDENCIA Y LIBERTAD” (Independence and Liberty). Mexico has the longest standing history in the Americas for producing large crown sized silver coins and the Cinco (Five) Peso Cuauhtémoc coin minted from 1947 to 1948 is a fine example. The coin is 40mm in diameter, weighs 30 grams, and has 0.868 ounces of silver giving it the highest silver content for a circulating coin at that time. The obverse design features the Mexican coat of arms - an eagle clutching a snake while it perches on a prickly pear cactus. On the outer periphery is the phrase “ESTADOS UNIDOS MEXICANOS”. The reverse design features the Aztec ruler, Cuauhtémoc. He took power of the Aztec nation in 1520 and was ultimately captured and executed by the Spanish invaders. On the outer periphery is the denomination “CINCO PESOS”, year of issue, weight & purity “30 GRAMOS LEY 0.900”, and the mint mark for the Mexico City Mint “Mo”. In 1950 the Mexico City Mint issued a special one year design to commemorate the inauguration of the new railway connecting the rest of Mexico to the State of Yucatan. The coin is 40 mm in diameter with 0.720 silver fineness and .6430 ounces of silver. The obverse design features the Mexican coat of arms, an eagle clutching a snake while it perches on a prickly pear cactus. In an arc around the design is the phrase “ESTADOS UNIDOS MEXICANOS”. Beneath the central design is the denomination “CINCO PESOS”, silver content "LEY 0.720", and weight "27 7/9 G". Below the denomination is the year of issue and mint mark “Mo” for the Mexico City Mint. 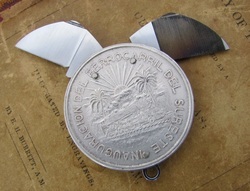 The reverse design features a locomotive passing by a plantation with a rising sun with rays and the year 1950. 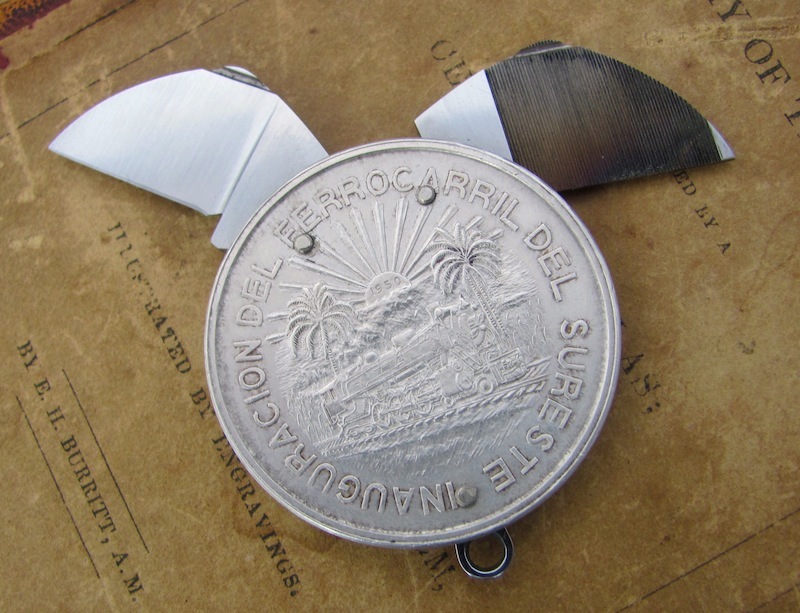 Encircling the design is the phrase “INAUGURACION DEL FERROCARRIL DEL SURESTE” or Inauguration of the Railway of the Southeast. 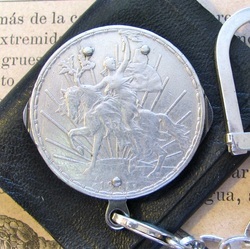 The coin edge is lettered with the words “COMERCIO AGRICULTURA INDUSTRIA”. In the early 20th century, Mexico’s most dense area of railways existed in the Yucatan region but it had one drawback… it was not connected to any of Mexico’s other rail systems. The rail systems in place during this time was primarily used to provide transportation from the haciendas to shipping ports on the Yucatan Peninsula for export. Since a highway system had yet to be established, the most effective way to travel to the Yucatan from other areas of Mexico was by ship. In the 1930’s the government of Mexico decided that Yucatan needed to be connected to the rest of the nation via rail and commissioned the poject which completed in 1950. The Southern Rail closed in 2007. Half of the 200,000 Southern Railroad coins minted were melted down to be used for 1968 Olympic 25 Peso Coins. 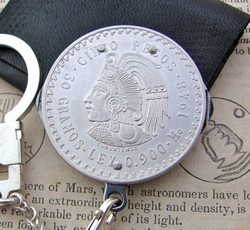 The Hidalgo 10 Pesos Silver Coin was minted from 1955-1956. It was created to honor the 19th century priest, Miguel Hidalgo, who rallied for independence from Spanish colonial rule. He is referred to as "Father of the Nation.". The coin contains a total of .8357 troy oz of fine silver. The design features the Mexican coat of arms on the obverse, picturing an eagle clutching a snake in its beak and claw while perched on the branch of a prickly pear cactus. Surrounding the eagle are the words, "ESTADOS UNIDOS MEXICANOS," or "United Mexican States," and the coin's denomination, weight, year and purity. 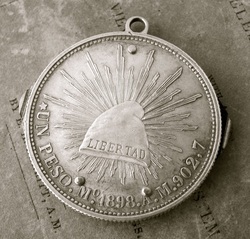 On the reverse of the coin Hidalgo's portrait appears atop his name, with "INDEPENDENCIA Y LIBERTAD" written along the upper edge. José Doroteo Arango Arámbula – better known by his pseudonym Francisco Villa or his nickname Pancho Villa – was one of the most prominent Mexican Revolutionary generals. 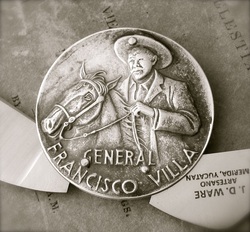 This Silver Medal was struck in 1960 to honor the 50th anniversary of the Mexican Revolution. The El Cazador was a Spanish brig that sank in the Gulf of Mexico in 1784. On October 20, 1783 it was sent by Charles III of Spain on a mission to bring much-needed hard currency to the Spanish colony of Louisiana. The ship sailed to Veracruz Mexico, where it was loaded with almost half a million Spanish Reales produced in Mexico City and Peru. King Carlos III enlisted his most trusted captain, Gabriel de Campos y Pineda, to captain the ship. On January 11, 1784, it sailed for New Orleans, and was never heard from again. Spain’s attempts to locate the ship were unsuccessful and in June 1784, El Cazador was officially listed as missing at sea. The loss of the ship's treasure was a devastating blow to the cash-strapped Spanish colony and in 1800 Spain was forced to cede Louisiana back to France. In 1803 Napoleon sold the territory to the US. Then, in 1993, the trawler Mistake, while fishing in the Gulf of Mexico fifty miles south of New Orleans, hung its net on a snag. When the crew hoisted the net and dumped the contents on the deck, they found the net was filled with silver coins. 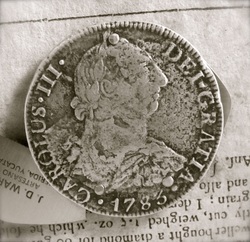 The coins bore markings from the Spanish mint in Mexico, along with the date 1783. Mexican Silver Reales and Pesos were widely circulated in China throughout the 18th, 19th and early 20th centuries as one of it's major, and most preferred, silver trade currencies. In 1949, Chiang Kai-shek's Nationalist government contracted with the US and Mexico to mint several million Silver Reales. The Mexico City mint still had the old dies in it's vaults and Mexico's Monetary Laws of 1905 allowed it to re-strke Reale coins from before 1898 (However, these are Pesos, not Reales, and so were actually minted in violation of Mexican Law!) The re-strikes were minted in Mexico City and in San Francisco. By the autumn of 1949, the Communist Revolutionaries, led by Mao Zedong, had taken over the country. As a result, most of the coins were never delivered. The San Francisco Pesos were melted down. The Mexico City coins were probably shipped to Hong Kong and were then taken by Chiang Kai-shek to Taiwan when he fled the Communists. The 1949 re-strikes can be identified by the position of the Mo mint mark. Most of them found today are in uncirculated condition.